Even faithful viewers of his online talk show about NC State football, “You Don’t Know Jack,” probably actually don’t know Jack — student and Wolfpack cornerback Jack Tocho, that is. Since he began hosting the show for the athletics department last autumn, Tocho has been the one asking questions. From his teammates to Pack head coach Dave Doeren, he puts guests on the hot seat to provide a wry, behind-the-scenes glimpse at life as a student-athlete. The focus, mostly, remains off Tocho. So let’s turn the tables on the inquisitive emcee. Tocho happens to be a junior in the Poole College of Management, majoring in finance with a minor in accounting. His toughest class this semester is probably tax accounting. He has two sisters, one older and one younger. He started playing football at age 8. His middle name, Zephania, comes from his paternal grandfather. People love to quote “interesting, interesting” — and other comments he makes regularly on his show — back to him via social media. And his hectic life as one of more than 500 student-athletes attending NC State on scholarship? Tocho calls that an amazing opportunity. If I were ever to speak to a donor about support, I would try to help them realize the true impact they are making on someone’s life by giving them a chance just to go to college. I have several teammates who are the first in their family to go, and that in itself is a blessing. It’s a quiet confidence that allows Tocho to move with purpose — thriving in stadiums filled with thousands of spectators and roaring only when necessary. 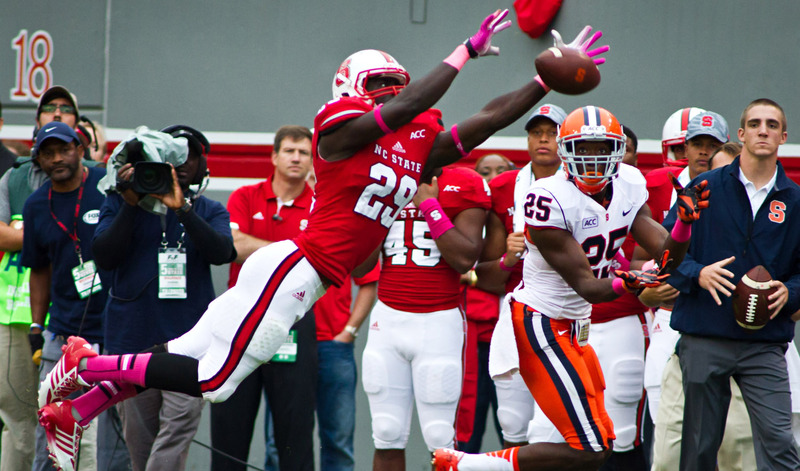 He started every game, finishing eighth in tackles and first in passes broken up (11), for the 2014 Wolfpack team that went 8-5 and won the Bitcoin St. Petersburg Bowl, and he earned the squad’s Dewayne Washington Award for Defensive Back of the Year. The previous season, Tocho started most of the season and was co-recipient of the team’s Philip Rivers Award, given to the most valuable freshman. Athlon Sports listed him among the Atlantic Coast Conference’s 10 most underrated players in one of its 2015 preseason publications. Don’t look at the mountain. Just climb. 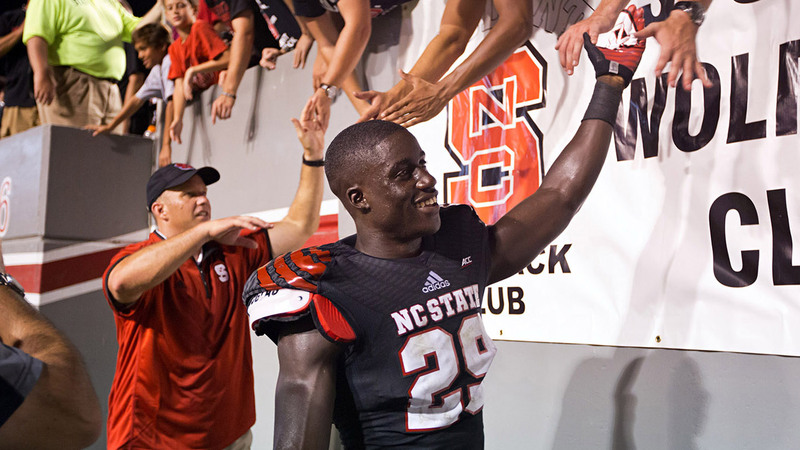 Beyond the field, Tocho has been an Academic All-ACC performer. He is a member of NC State’s Student-Athlete Advisory Committee, which plans service and social events, and provides discussion and guidance on issues such as cost-of-attendance stipends. Teammates elected him as one of two cornerbacks to represent their position group on the squad’s Wolfpack Leadership Council. Pretty good, pretty good, as Tocho might say on his show, for the Mint Hill native who graduated from Charlotte’s Independence High School. By the end of his sophomore football season there, Tocho found himself recruited by programs including NC State, but doubts about his physical capabilities lingered. The summer before his senior year, Wolfpack coaches challenged Tocho: Prove yourself at a one-day football camp. Enter, lion. The next day, NC State offered him a scholarship. Jack Tocho, a member of the Wolfpack football team, spoke to the Pullen Society earlier this year as a representative of more than 500 student-athletes. His parents, David and Gertrude, immigrated to the United States from Kenya in pursuit of a better life. Jack is a first-generation American. “Having been to Kenya three times, I have experienced first-hand the conditions my extended family members live in,” he said. “All of the relatives in the United States, including my family, have always sent money back to support them. If I were to have to pay for college, I would be working to pay off loans, of course, but it was understood that my parents would support me as well. OK, OK, that’s cool. What’s best about being a student-athlete? The wide spectrum of university experiences. Student-athletes play an important role as public ambassadors for NC State and should be positive forces in the community, Tocho said; their range of backgrounds adds to campus diversity. Balancing sports responsibilities with school commitments can be challenging but paves the way for post-college success. Jack Tocho in full pass-defense mode. In addition to football and his leadership roles, Tocho participates in activities through a local church. This past summer, he completed a business operations internship in the university’s Weisiger-Brown Athletics Facility. And he joins teammates periodically in community service efforts such as visiting hospitals or hosting football clinics for foster children. “I enjoy any time we get the chance to inspire kids, to be a role model or to provide a little hope,” he said. Private financial support of NC State scholarships, as well as athletics and academic facilities, opens many doors for students. Tocho hopes for a chance to play in the NFL but plans to pursue a master’s in accounting and earn his CPA. Then there’s the talk show — and the questions. Tocho’s favorite food? Ribs. Favorite NC State classes? Two accounting courses taken with Chris McKittrick, also known as Mr. Mac. Top Wolfpack football moment? His first collegiate start at cornerback, when he grabbed two interceptions against Syracuse. Where would he like to end up after college? Probably out west or farther south, to experience a different part of the United States. If someone could know only three quick things about Jack, what should they be? And maybe one more thing: This particular lion is glad to be a wolf. 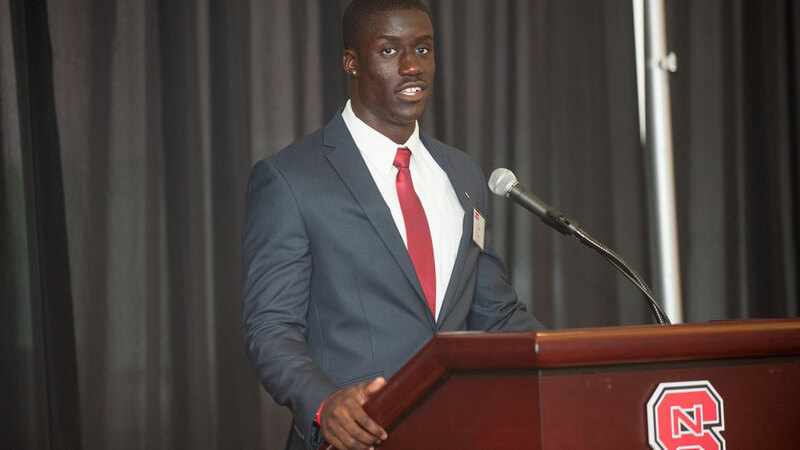 “I represent a wonderful university wherever I go,” Tocho said.